plenty of sauerkraut, standard soup vegetables and (for meat lovers) keilbasa (Polish sausage) (Peter). I will chop the pork hock meat and add some (lowish fat) keilbasa. 1. Boil 3 or 4 pork hocks for 90 minutes or so on low heat. Reserve hocks for later; let stock cool then store in fridge overnight. 2. Cut meat and have ready. 3. Finely cut onion and add to oil in soup pot. Fry onions for 5 minutes or so then add crushed garlic for another minute or so. 4. Skim off fat from top of stock, strain if desired, then add to onions and start warming. 5. Cut potatoes into bite size chunks and add to stock. Let cook for 3 minutes or so then add carrots - chopped smallish. 5A. Once the potatoes are mostly cooked you can (and I do) use the hand blender to thicken the soup base - leave some big chunks tho'. 6. 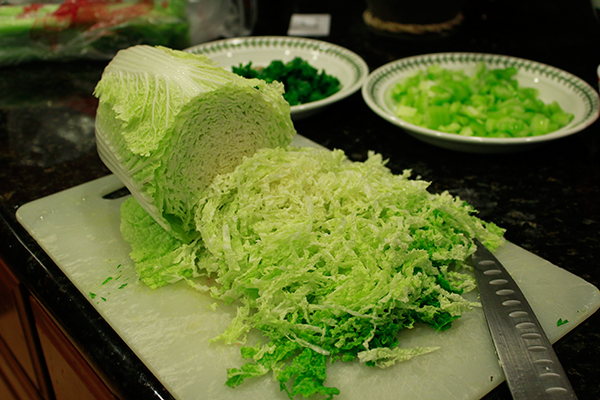 Wait another 3 minutes or so then add celery cross-cut smallish. 8. Bring quickly to boil then test for salt and pepper - add as needed. 8. Add chopped dill and serve with crusty bread.